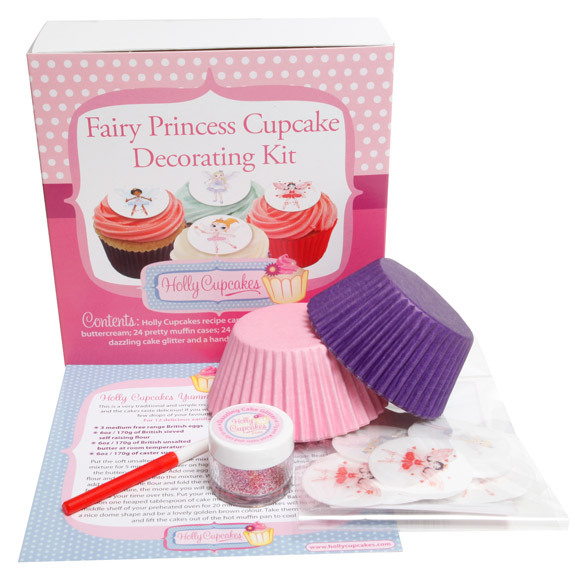 A Cupcake Decorating Kit to decorate girly Fairy Princess cupcakes. This kit contains a Holly Cupcakes recipe card for the perfect cupcakes and buttercream; 24 pretty muffin cases; dazzling cake glitter; 24 assorted pretty fairy princess edible cake decorations and a brush to apply the glitter. The kit is beautifully packaged in a fully colour printed box and makes the perfect gift - for yourself or a friend!